At the Cooper-Young Festival many artists were selling and displaying their paintings. At first sight Kristi Bauer’s booth “Pinot’s Palette” looked just like one of those, but there was one difference: The visitors could paint their own pictures! The painting studio, which is located on Sanderlin Road in East Memphis, usually offers classes during which people can come by, bring a bottle of wine and food, and learn how to draw step by step. remember that they are artists,” said founder Kristi Bauer. This rough quote by Picasso describes the basic idea of their painting studio. paintings at the Cooper-Young Festival. This was her first year displaying and selling pictures with Pinot’s Palette. 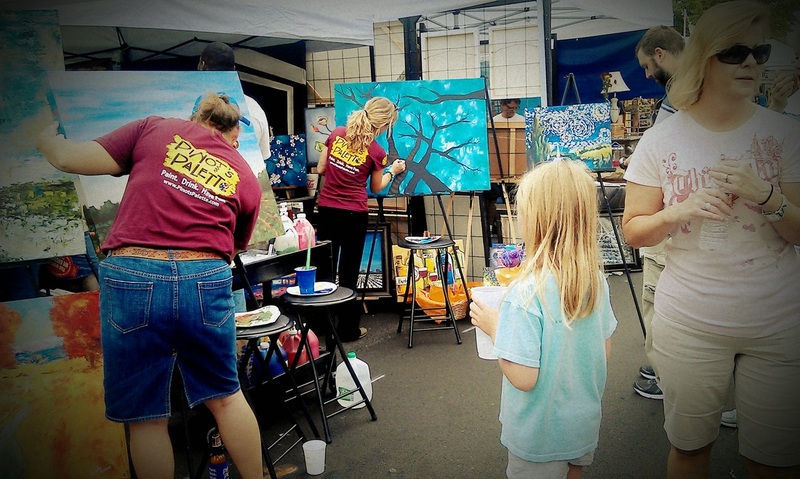 Visitors of the festival could watch live painting by the Pinot’s Palette team members and then paint their own pictures afterwards...with professional assistance. So maybe the next visitor who passed by and started drawing discovered a new talent. Then the Cooper-Young Festival could have one more artist stand, next year. Barbara Werner covers Arts & Culture for MicroMemphis. You can send story ideas here.